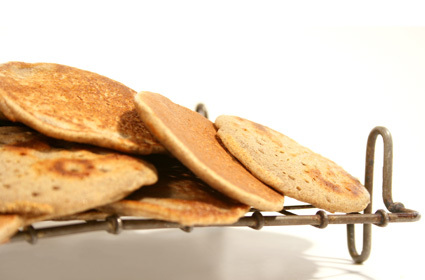 These traditional drop scones are often served as canapés with sour cream and other toppings however they are also delicious served with fruit puree or chocolate sauce. This recipe will make 40/45 blinis which can be frozen if not required immediately and they’re gluten free. Mix in the flour, baking powder and milk. Beat well to make a smooth batter smooth. Put tablespoons of the batter into the hot pan to make 5cm/2” pancakes. Cook until small bubbles appear and underside is golden. Turn over the blini and cook the other side. Continue until the batter is used. Cover the blini with film or foil until required.